Powerful tools to collect information rapidly. 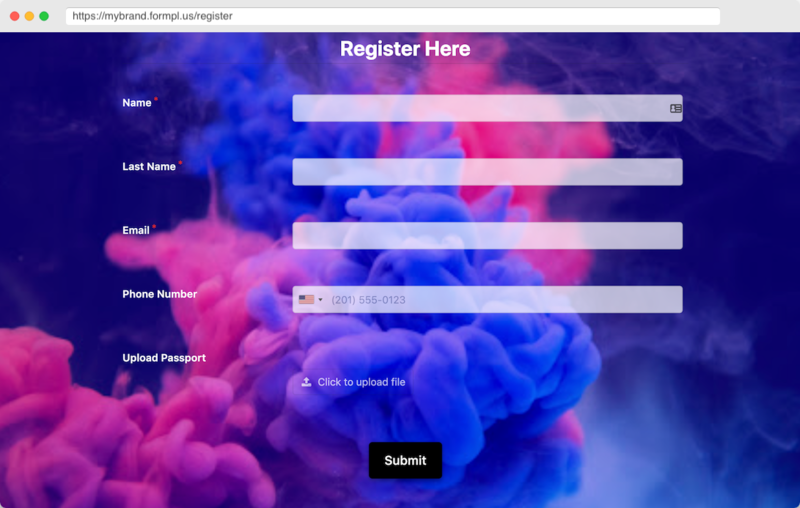 Our easy to use form builder allows you to create powerful forms within minutes on any device - simply click or drag and drop your desired form fields into the builder. Create the perfect form when you select from our selection of over 30 form field types, including repeating data tables. All forms created are responsive and can be filled on any device. Divide your form into segments of related subjects and similar pages. This would help increase completion rate and accuracy. Select from a wide range of prebuilt form templates to ease your form building process. Quickly create and manage forms on the go with the mobile form builder. All forms created are responsive and can be filled on any device. Automatically calculate form values and scores with our online form calculator. Process and compute values from product orders, event registrations, online donations, expense reimbursements, and so much more. Don’t just send out basic forms, create forms tailored to your brand using the various customisation options available. Go even further and create forms in your language of choice. Style your forms to match your design using our built-in options or with custom CSS. Add your company's logo and associated images to your form using the background image and logo feature. Receive email notifications of submissions, send out a custom message to users as a confirmation email upon successful form submission, send submission notification to others on your team. 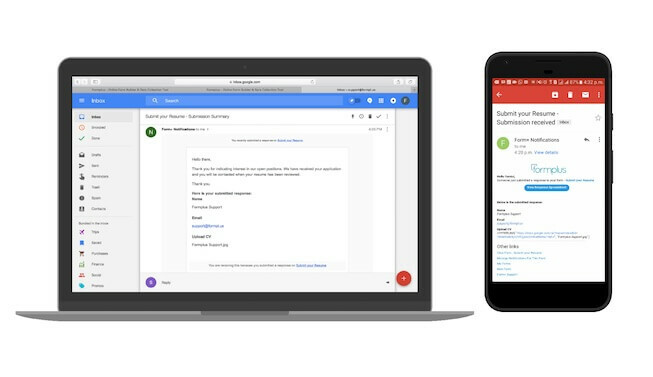 Receive email notifications of submissions. Send confirmation emails to multiple email addresses. Send autoresponder emails to different recipients based on the answers submitted in a form. Receive email notifications of submissions based on your preferred schedule with the submitted data included in the email body and also as a PDF/Word attachment. Personalize your user experience by using conditional logic to tailor your forms. Make a field required, or break long forms into multi-pages or even divide single page forms into different sections for an improved experience. Gather clean and error-free data when you set validation limits on form fields. Redirect your respondents to another website or form after a successful form submission. use existing information to pre-populate form fields from a URL so your respondents can save time. Need a way to cut form filling time by at least half? The Lookup field can access values from other forms and populate options in a new form. Streamline your respondents using form logic. Show or hide form fields based on answers provided by respondents, giving you short forms with better conversion rate. Adopt online forms to help you collaborate better across your organization. Formplus forms can be fitted with Workflows and Approvals add multiple users can be added to help you work smarter..
Add multiple people within your organization and permit them to collect, review, and edit information on your company’s forms. Combine a powerful online form builder with logic to implement flexible automation across your organization. We are flexible. You can choose to store your received data in your cloud storage of choice. You also have the option to opt-out of storing your data on our servers. Users can submit files, photos, or videos via your online forms without any restriction . Get submitted data from your forms live updated into spreadsheets automatically created for each form. Store files received from your form on Formplus or in your preferred cloud storage option(Google Drive and Dropbox currently available). With our seamless native Google Sheets integration, get submitted data from your forms live updated into spreadsheets automatically created for each form. Being able to receive payments from anywhere across the world is the bedrock of any business - Formplus allows you create online forms that can receive payments online. We also adhere to the strictest security standards, including PCI compliance, giving that seal of assurance that your business is legitimate. With no monthly fees and no hidden charges, Stripe forms offer a simple solution to receiving payment via order forms. The number one payment processor in the world - PayPal accepts payments and processes credit cards from over 200 countries worldwide. Large or small scale business? We have got you covered. Receive payments across Africa and the world with our Flutterwave integration. Add your organisation or brand name to your form URLs. Create friendly, short URLs with your brand name or form title. With a URL shortening service for forms, you can create shortened links for all forms created with Formplus. All Formplus forms are SSL enabled, making sure that all connections between your web browser and our servers are secure 100% of the time. Collect secure encrypted information via SSL enabled Formplus forms. you can use CAPTCHA to keep your form data safe from spammers and bots. Formplus forms are GDPR compliant and can be used to collect consent, and user opt-ins. To add an extra layer of security in your forms, you can use CAPTCHA to keep your form data safe from spammers and bots. Gather useful insights from forms. The Analytics dashboard reveals information like the total form views, unique views, abandonment rate, conversion rate, average time it takes to complete a form, top devices, and the countries your form views are from. Observe activities on your form, gain insight on how your form is being accessed. View the summary of submitted responses as charts and even download the generated charts. Collect key insights to help make better decisions for your organization. View the summary of submitted responses as charts and even download the generated charts. Embed your form into any web page; with no stress, no fuss! Share your forms all over your social media with just a button click!. Collecting electronic signatures via online forms is made easy with Formplus. All you need to do is add the signature field in the form builder. Users can sign and submit forms in minutes, without printing out paper forms. The online signature field is very responsive and easy to use on any device – laptop, tablet, or smartphone. Users can sign and submit forms in minutes, without printing out paper forms. All received signatures will appear as images in your cloud storage once they are submitted. Collect data in remote locations or places without reliable internet connection. 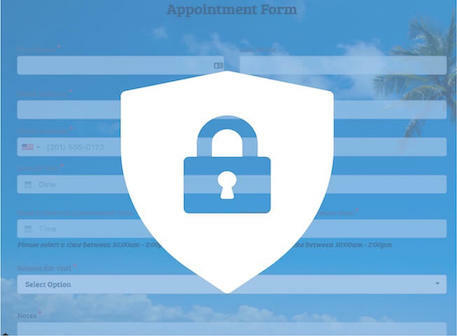 Offline forms can also act as a backup to the standard online forms especially in cases where you have unreliable WiFi, such as large conferences and field surveys. Using conversational SMS, you can collect data on any mobile device even without an internet connection. Your respondents can fill out your form as many times as possible in the offline mode. Using conversational SMS, you can collect data on any mobile device even without an internet connection. 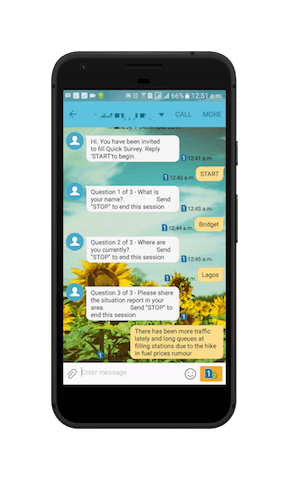 Form questions are sent and can be responded to via SMS. All Formplus forms are accessible offline by default. Your respondents can fill out your form as many times as possible in the offline mode and responses are synced once there is an internet connection*. With the user’s consent, the location feature allows you to determine the physical location of the person who is filling out your form. Want to know the location of your respondents? This feature uses Google Maps Web Services to pinpoint the nearest physical address. 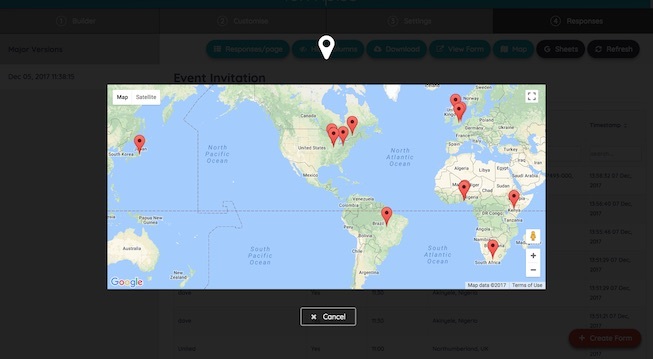 You can view obtained locations individually or see where all responses are coming from at a glance on a map. This feature uses Google Maps Web Services to pinpoint the nearest physical address. The obtained coordinates is converted to an address and are both included with each submitted response data. You can view obtained locations individually or see where all responses are coming from at a glance on a map. You can also view the Street View of a pinpointed location. Give your form users the opportunity to save partially filled forms and continue filling it at a more convenient time from any device or browser. Don't pressure your respondents to fill out your form at once, they can always return to it when you enable save and continue. Don't pressure your respondents to fill out your form at once, they can always return to it when you enable the save and continue option.